Jill Soloway is on a mission. The Transparent creator's new book, She Wants It: Desire, Power, and Toppling the Patriarchy, is part memoir and part activist's manual, tracing her own feminist awakening alongside her career evolution. For Soloway - who says "she" and "her" pronouns are "fine," but "they" and "them" are "frosting" - toppling the patriarchy begins with drowning out the noise of division. "I learned that I wasn't the leader I wanted to be, because I couldn't pivot quickly enough," Soloway told us. "I was definitely really, really focused on protecting my show, protecting everybody's livelihood, more so than I was really able to take in the reality of what was happening. . . It took me quite a few months to understand that the thing I was hoping for, which was: 'Oh, everybody jokes around on set. This was a joke, right?' actually doesn't hold water when you start to bring in patriarchy and white supremacy into the conversation." 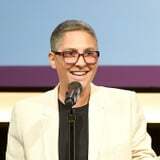 "The book is really about desire and creativity and leadership, and I had this kind of giant realization that as a director, as a producer, as a leader, you need to be connected to your desire all the time," Soloway said. "But 'she wants it' is also a phrase that's used by one man to another to justify sexual violence. 'She wants it' is a way that two men corroborate their perspective together and name woman as other. And, in fact, the question to me became, how can we be connected to our desire - as directors, as producers, as leaders - if our entire lives women are shamed for having any desire at all?"